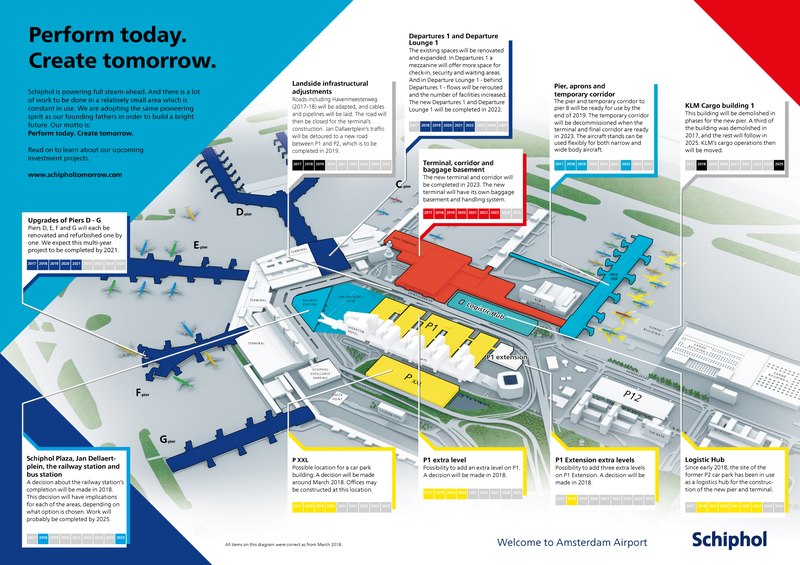 With the construction of a new pier and terminal, you are guaranteed a smooth journey through Schiphol in your future travels. More and more people are traveling through Schiphol. By redeveloping Departures & Lounge 1, we are creating more space and facilities. Comfortable seating areas and workspaces, modern sanitary facilities and more shops and eateries: Traveling through Schiphol will be even more enjoyable with the upgrade to these piers. A lot needs to happen on landside as well. In the coming months, we are laying cables, pipes and other infrastructure. P1, P3, P4, P5, P6….What is missing here? Exactly: the P2 parking garage. That is because it has been demolished. Instead, we are working on other, smarter parking solutions. We are not only concerned with safety in the air, but also safety on and under the ground. That is why we are renovating the tunnel system under the runways. We are expanding the Uniform platform at Schiphol from five buffer positions to eleven. This provides more space to temporarily park widebody aircraft. We are doubling taxiway Quebec. This will reduce queues and delays, and make the ground situation clearer for Air Traffic Control. Schiphol is building a logistics hub in order to manage the many construction and renovation projects currently underway at Schiphol. New roads need new signs. That is why we adjusted more than half of the signs in and around the airport.